Contractors for the NDDOT Fargo District and City of Fargo Interstate 94 (I-94) and South University Drive interchange and road improvement project shifted drivers to the same side of the roadway. All open driving lanes are carried on the existing pavement of the west side of the work zone. Motorists have two lanes open in both the northbound and southbound direction. Turning movements from the west side business driveway and 18th Avenue S intersection access has changed with this traffic shift. Motorists are able to turn into traffic from 18th Avenue S to head north or south on South University Drive. Access onto to South University from I-94 remains open for use of the traveling public. 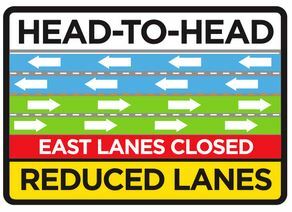 The head-to-head traffic shift allows crews to be able to begin removing the east side of the roadway for the needed improvements. Work on the east side will take about two months to complete underground and paving operations. Traffic will then shift to the newly constructed east side roadway to begin the reconstruction of the west side of South University Drive and ramp improvements. I-94 and South University Drive work zone shifted drivers to the same side of the roadway. All open driving lanes are on the west side from 18th Avenue to 21st Avenue S. Two lanes are open in both the northbound and southbound direction.